Rightmove is the UK’s largest online property portal. The go-to website for all property related advice and services, rightmove.co.uk attracts the largest audience of home hunters in the UK. Our ongoing relationship with Rightmove means we’ve been involved in some great projects, including the Happy at Home survey and more recently, the redesign of Rightmove’s online hub, which provides tools and resources for those working in the property industry. It was a pleasure to be asked to work with the Rightmove team on the Moving Stories website, returning to a consumer audience for this project. We collaborated with the Rightmove design team on the redesign their blog for 2018, showcasing some of their more unusual customer stories on a dedicated page. 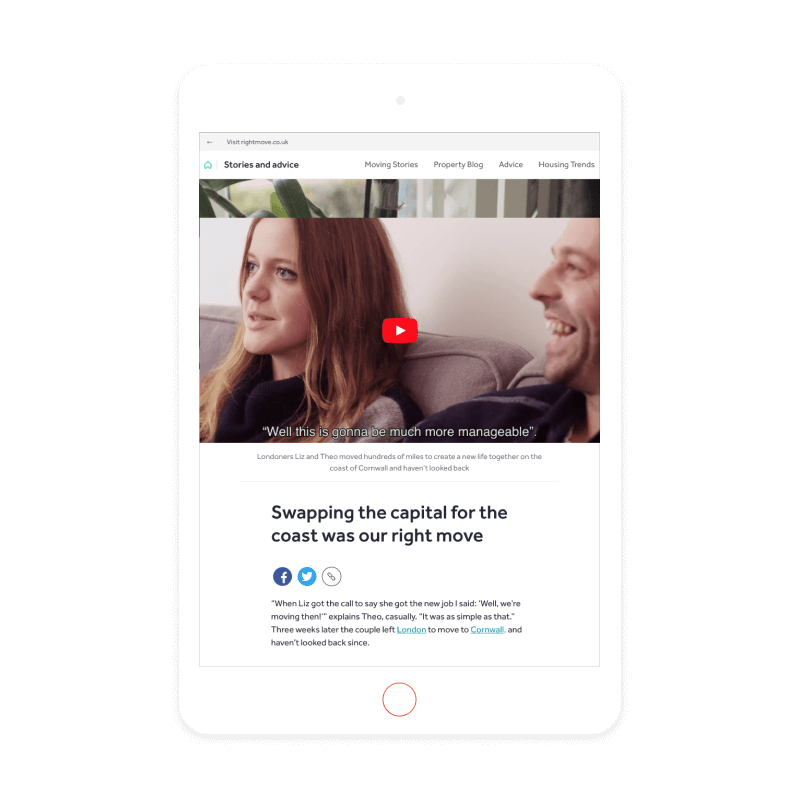 The aim of this redesign was to highlight how Rightmove had helped people to ‘make the right move’, and to drive more traffic to rightmove.co.uk. The new design needed to be a separate website, in keeping with the Rightmove brand so that it is as instantly recognisable as the main website that it links back to. 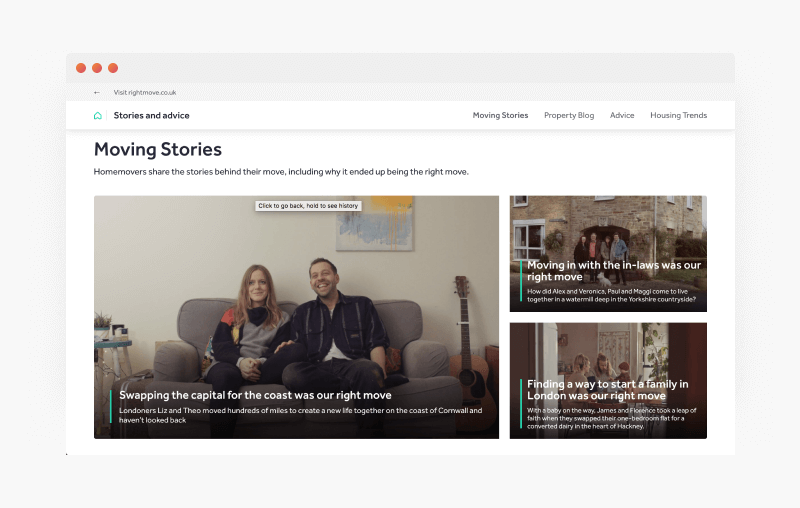 Working together with the Rightmove team, we created a brand new ‘Stories and Advice’ website, which would host the blog and the new ‘Moving Stories’ page. We followed the Rightmove brand guidelines closely as we created the new website, and continued to work with the team throughout the process to ensure an eye-catching yet recognisable look for the new site. Once the designs were approved, we developed three new themes based on these designs; one theme for the ‘Stories and Advice’ site, one for the blog and one for the site that would showcase the moving stories – the main focus of the new blog site. To make the ‘Moving Stories’ site engaging from the outset, we made the design very visual, focusing on the people and their stories by highlighting each story with a strong image that would tell part of the story and entice site visitors to click through for more. We kept the main ‘Stories and Advice’ site design simple so as not to distract from the moving stories. For each individual story, we created a page template that allows video to be embedded in the header as the main feature of the page, to really bring the people and their stories to life. We also added social sharing buttons to the header, to make it easy for site visitors to share the stories that move them, and strong images at the bottom of each page encourage people to click through to read more moving stories. For the blog, we created an easy to use post template that can be adapted for different sorts of blog content. 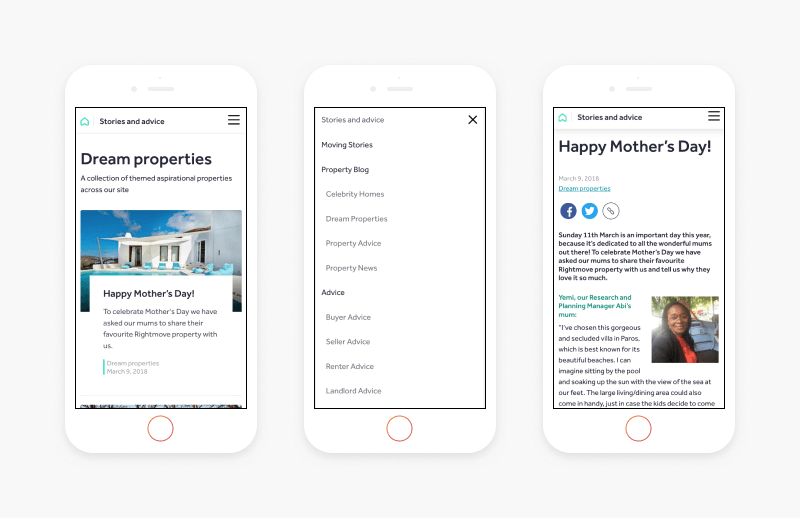 We added custom designed icons for the different subjects Rightmove covers – from celebrity homes to property advice – creating a different page for each subject, to highlight the latest posts. 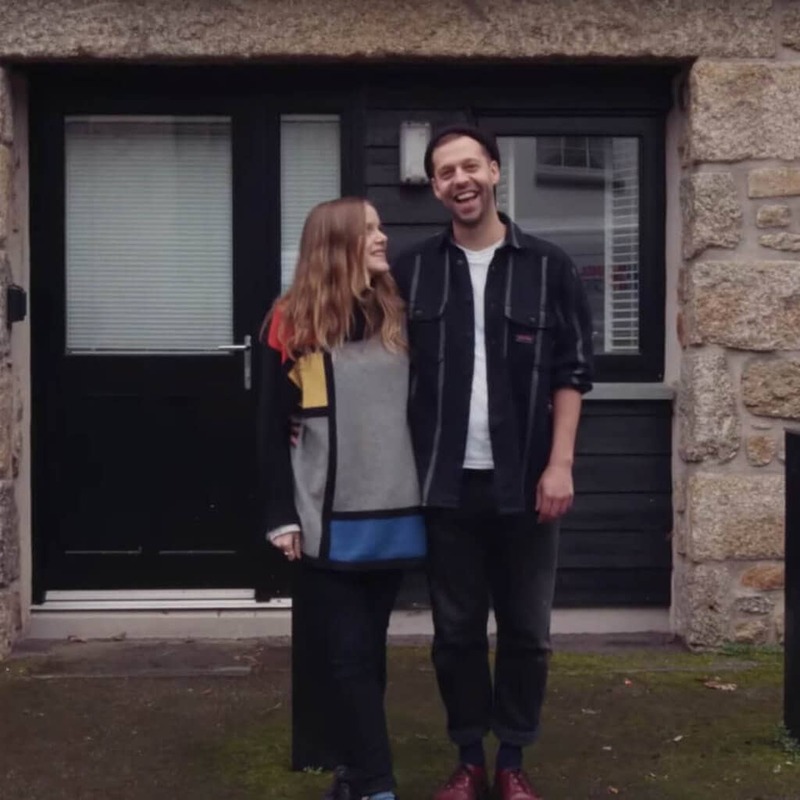 The new site is now a one-stop shop for all advice and inspiration for anyone thinking about moving house, leading them right to the main Rightmove website where they can browse for, and buy or rent, their next home and be the star of their own ‘moving story’.